"There are no magic pills." The phrase is not original or even profound, but coming from American World Cup alpine ski racer Lindsey Vonn or NBA legend LeBron James, it has a different ring to it. Vonn and James are two of the celebrity founders of Ladder, a new wellness company whose other co-founders are Cindy Crawford and Arnold Schwarzenegger. The company sells direct-to-consumer energy powders and other supplements along with content and guidance. To introduce this subscription-based brand to the world, the agency Human Design created a series of commercials and a viral media campaign. Eight 30-second spots featuring Crawford, Vonn, James and Schwarzenegger have begun rolling out online. Social media cutdowns will also be created so the work can be featured as Facebook posts and Instagram posts and stories. The goal is to drive viewers to the company’s website to customize a plan. The founding celebrities help add to the brand’s authenticity, says Jack Gray, chief marketing officer at Ladder, who declined to reveal the campaign’s budget. 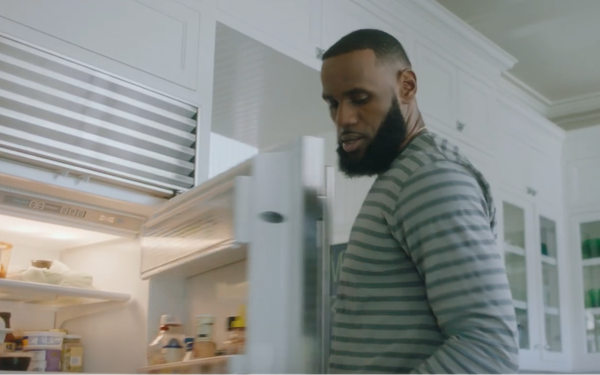 “After LeBron’s infamous cramping during the 2014 NBA Finals, he and his trainer worked together to find new ways to improve his diet,” Gray tells Marketing Daily. Lindsey Vonn also struggled to find nutrition products that met the rigorous standards of the World Anti-Doping Agency. When she learned about the project, she was excited to bring her insights and experience to help fix a problem that frustrated her and so many of her fellow Olympians, Gray says. “In order to build a brand that was not limited just to improving athletic performance, they reached out to Cindy Crawford, who is known for her balanced approach to health," Gray says. Instead of magic pills and one-size-fits-all fads, Ladder is built on three pillars: scientifically backed information, community interaction with experts, and customized nutrition products, he adds.